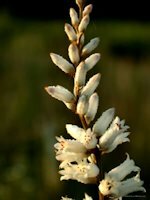 This white flowering perennial is otherwise known commonly as Stargrass, Unicron Root, and Colic-Root. Aletris has a white flower that blooms May to August and has a leafless stem. Aletris is found in both dry and moist peat or sand. It also aids in digestion, and has both anti-inflammatory and estrogenic properties.